A black and white photograph of Bobby Clarke riding a horse. He has the number 11 on a bib pinned to the front of his shirt. 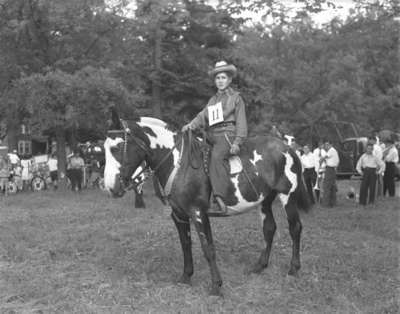 Bobby Clarke riding a horse (Image 2 of 2), June 26, 1946, Marjorie Ruddy. Whitby Archives A2013_0401_1215.